Continuous Positive Airway Pressure (CPAP) therapy has been long recognized as the most efficacious treatment for conditions like Obstructive Sleep Apnea (OSA) and other sleep-related breathing disorders. While CPAP has been used safely and effectively for over 30 years, there have been recent questions as to whether there are side effects from CPAP use that may cause damage to the lungs. Though not common, there are a few circumstances that can potentially increase the likelihood of CPAP contributing to or causing problems with the lungs. Although side effects are common with CPAP use, particularly for those that are just starting therapy, they are generally very minor and diminish as the wearer adjusts to using the mask and equipment. Serious medical issues and/or side effects are quite rare, but not unheard of. The most serious lung problem that may affect CPAP users is pneumonia. A recently published longitudinal study examined the incidence of pneumonia in more than 34,000 sleep apnea patients and controls. The study found CPAP users were 32 percent more likely to contract pneumonia compared to the control group. Sleep apnea patients who did not use CPAP were also at greater risk than the general population, but the combination of OSA and CPAP use resulted in a greater likelihood of developing pneumonia overall. Most of the CPAP patients were older and had comorbid medical conditions, such as diabetes or heart disease. The researchers hypothesized the increased risk could be due to a greater potential for the aspiration of pharyngeal fluids that may contain bacteria and can thus cause lung infections, including pneumonia. Additionally, they note the interruptions in sleep that accompany severe OSA may have a negative effect on the patient's immune system, which can ultimately compromise his or her health and make him more susceptible to all types of lung infections. Although increased pneumonia susceptibility is one of the more serious complications of CPAP therapy, other minor respiratory symptoms can occur. These are generally very mild and can include dry nose, irritated nasal passages, dry mouth and throat, coughing and/or itchy-feeling in the throat. Most of these symptoms can be alleviated by adding a heated humidifier to an existing CPAP device or upgrading to a newer model that includes a built-in humidifier. Most of the other effects CPAP users experience are related to the cleanliness and maintenance of the CPAP equipment, rather than its function. Keeping the equipment clean and as moisture-free as possible reduces the likelihood of bacterial growth, which could potentially have an adverse effect on health. A study conducted in 2007 examined the use of a hydrophobic filter in conjunction with CPAP machines that use heated, humidified air. The researchers discovered machines that did not have a proper filter placed between the water reservoir and mask were likely aerosolizing bacteria, which could contribute to lung infection. Those machines using a proper hydrophobic filter significantly reduced the chance of inhaling aerosolized bacteria. Another source of possible bacterial growth is in the tubing, so it is very important to keep it as clean and as dry as possible. Moisture is likely to form inside the tube when the ambient air is cooler than the humidified air being pumped by the machine. This is called rainout. To avoid rainout, raise the ambient temperature, keep the CPAP level with the bed height, insulate the tubing, or purchase a machine with a rainout reduction feature. A few years ago, a woman who used CPAP regularly without any issues suddenly developed lung problems when she used well water while traveling, instead of the normal distilled water she regularly used at home. Initially, experts suspected the well water itself contained contaminants that made the patient ill, but they later found that work completed on the pipes in the well caused the problem. The woman was ultimately diagnosed with bronchiolitis, a moderately severe lung infection. The condition cleared completely with treatment, and the patient had no lasting effects. Experiencing problems with lung functioning is very unlikely when using a CPAP device properly. CPAP is the best non-surgical treatment for OSA, and it offers a number of health benefits that far outweigh the slight risk of respiratory infection. 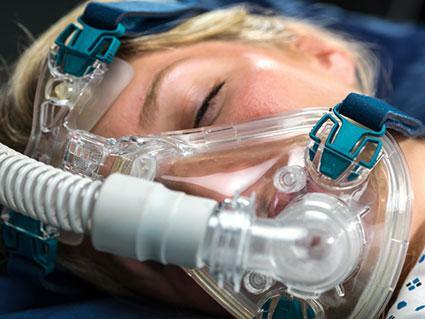 CPAP is a lifesaving device for many, and thus it would be far riskier to discontinue treatment. For anyone concerned about lung complications due to their CPAP use, or for those who have comorbid medical conditions, talking with your health care professional should alleviate any concerns and keep you on the path to wellness.